Buildings as dynamic as our teamwork. ZVI Construction executes projects with agility and quality. From Sydney, to London, to Boston, ZVI constructs student housing and academic facilities. We have extensive experience customizing commercial spaces. We strive to make each work environment functional and aesthetically enjoyable. Together with healthcare providers, we are able to build spaces that improves productivity and overall satisfaction of staff and patients alike. ZVI specializes in luxury multi-family complexes. We build spaces that are highly functional and cozy. Currently the home of Boston University’s Information Technology offices, 179 Amory Street was once a dilapidated office space. The eight month project began in January of 2014 with the demolition of two undulating, sinking basement slabs, a mezzanine level, and multiple sets of stairs. ZVI constructed a new slab, three staircases, and new interior layout complete with an elevator, dumbwaiter, and all new mechanical, plumbing, electrical, and fire protection systems. ZVI worked as team with Boston University, the architects, and engineers to complete this project on an aggressive schedule without compromising quality. The team completed the 22,000 gut renovation in August of 2014. ZVI created an open-concept design featuring an open kitchen with state-of-the-art kitchen equipment and custom folding glass doors, which open onto the restaurant’s patio. The design build included installation of new mechanicals, millwork, and finishes. Utilizing every bit of the 2,068 square feet, ZVI constructed an efficient and welcoming restaurant design for the Butcher Block Grill. One of our oldest clients, ZVI has worked for the Fessenden School for the past 10 years. In the summer of 2014 we expanded the pre-kindergarten building, adding two classrooms. With a strict schedule dictated by the return of the students, there was no room for schedule error. ZVI ushered the project through the City of Newton’s Zoning, Fire Department, and Permit reviews; continued on to erect a structural steel frame, build the exterior façade and finish the interior customized classroom spaces. Our team completed this project concurrently with other campus renovations. ZVI converted an existing 7,500 square foot warehouse into a state-of-the-art custom bakery and café. Forge Bakery was a design-build project – we worked directly with the client to craft the space to meet their specific needs. Forge features an industrial look with exposed ceilings and polished concrete floor. We integrated baking equipment, including an Italian oven, into a custom mechanical system and installed all new plumbing and electrical systems. Located in the vibrant South End neighborhood of Boston, ZVI gave these apartments a luxury makeover. The scope of work included replacing the laminate countertops with granite, installing all new floor finishes, and creating custom closet millwork. ZVI performed the work in an occupied apartment complex, delivering the apartments on time and on budget. Recipient of the Development Excellence Award for Student Housing Development by the Urban Task Force of Sydney, 15-25 Regent Street is a new ground-up construction property comprising approximately 69,000 square feet, in a seven-story above ground structure with two additional underground levels. Completed in 2010, the structure was built to accommodate student housing, office and classroom space for Boston University. This property also incorporates street-level retail to serve as an amenity to building residents and includes 12 underground parking spaces and bike storage. The building is served by three elevators, and has separate entrances and lobbies for the residential and office components. The residential component includes a total of 44 apartment-style single bedroom residences accommodating 164 students, each with individual bedrooms, as well as a two-bedroom manager’s unit. The office/classroom area contains a total of 1,411 square meters including a 160-seat auditorium. A rooftop terrace with function space and a professional kitchen serves as an additional amenity to this facility, along with numerous student lounges, computer rooms and laundry facilities. Construction commenced in the spring of 2009, and was completed ahead of schedule in December 2010. Starting with a nine units, ZVI transformed the 100 year old masonry building into a twelve unit luxury apartment rental. We gutted the building, underpinned the exterior perimeter, excavated the basement to create ceiling height and allow for basement units. ZVI value engineered the complex structural portion, performed a historical renovation of unique building features, and performed layout optimization. 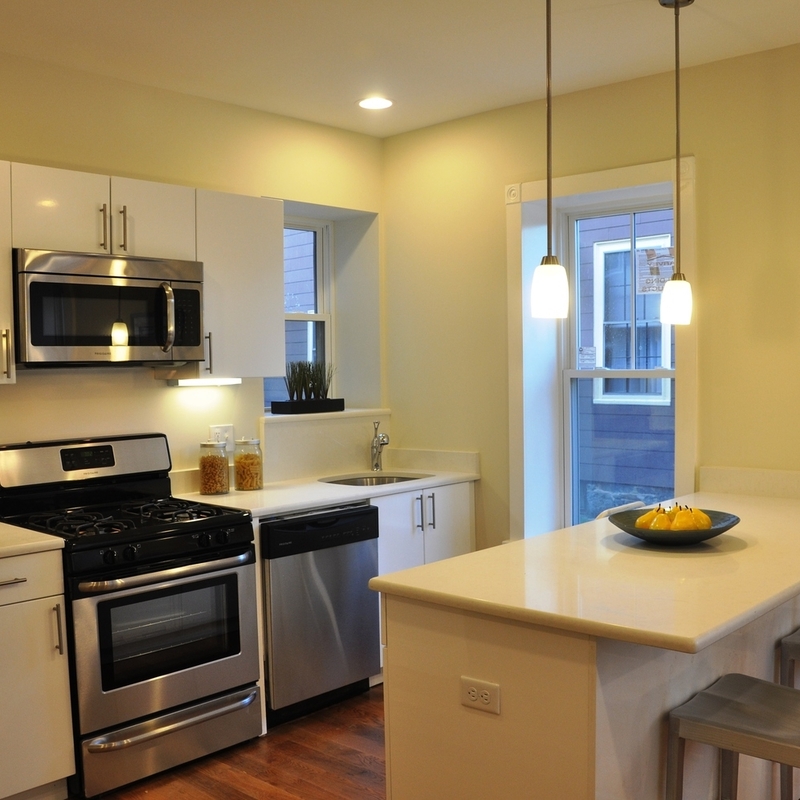 The Energy Star rated property contains premium finishes and carpentry. ZVI transformed the existing shell of an old drycleaner’s into a luxury salon and spa. ZVI worked alongside the owner of Zpro to achieve a contemporary and sleek design without compromising the functionality of the salon. By constructed a mezzanine level and installing a spiral staircase and an elevator, ZVI added 482 square foot to the existing space. The 1,968 square foot renovation includes a polished concrete floor, newly installed mechanical system, and custom plumbing for stylist, manicure, and pedicure stations. This spectacular, cutting-edge student housing facility, formerly the historic Royal Waterloo Hospital for Women and Children, is the result of ZVI's 55,000 SF gut renovation. ZVI is responsible for all aspects of this build-and-design project. From restoration of the authentic facade, intricate interior decor, and original elevators, to installation of modern en-suite kitchen and bathrooms and state of the art amenities, ZVI created a living facility that appeals to modern students while simultaneously maintaining the property's historical extravagance. The Waterloo residence now houses students from the University of Notre Dame.